A solid little machine, but not quite the all-rounder we were hoping for. Dell's Inspiron Mini range has grown over the years from tiny nine-inch models to larger 12-inch ultraportables and finally settled on the 10-inch Inspiron Mini 1018. A well-made and highly usable netbook, it's easy to recommend, but it lacks the flair of some of its rivals. While the default model is black, a choice of pink or red colour schemes are available for an extra £19. The chassis is by far one of the most rugged around and feels extremely tough. As such, it lacks the svelte style of the Asus Eee PC Seashell 1015PE, making it a hardy but slightly bland choice. The rock-solid build quality continues to the user interface, with the keyboard being one of the best we have used. Avoiding the use of the isolation style design seen on the Asus, all keys feel larger and more accessible with the smooth typing action proving flawless. Unfortunately, the tiny touchpad doesn't fare quite as well. Measuring 65 x 30mm, it feels too wide and not nearly deep enough, making it awkward to scroll smoothly across the screen in a single motion. Thankfully, the mouse buttons are large enough to be used more comfortably. The 10.1-inch Super-TFT screen is far more pleasing. One of the brightest panels on a netbook, images pop from the screen and colours are vivid. The screen only folds back 45 degrees from vertical, however, so it can be tricky to get a comfortable viewing angle. Part of the reason for this is that Dell has indented the screen's hinge by 19mm to make room for a strip of textured plastic on the rear. It's an unusual design choice, but does make the Dell more comfortable to carry. When combined with the 427 minutes of use we managed to get from the battery, this is a great choice for mobile workers and for school children. However, a lot of other netbooks provide much longer battery lives. Where the Dell excels is its storage. The 250GB hard drive matches the Asus, providing 90GB more storage than both the Acer Aspire One D260 and Packard Bell Dot S. This will easily hold large multimedia collections. Also, the inclusion of Microsoft Office Starter 2010 software is a real bonus at this price and is a rarity in the netbook market. Providing stripped-down versions of Microsoft's word processing and spreadsheet tools, it provides a great way to get to work straight from the box. 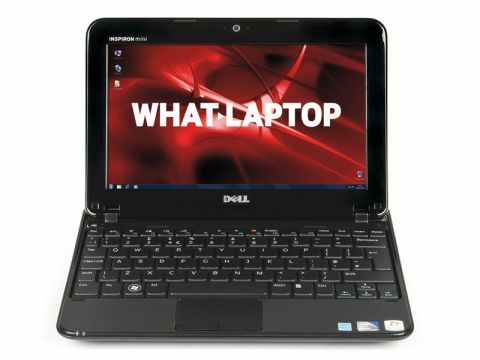 On its own, the Inspiron Mini 1018 is a great netbook, and ideal for first-time buyers. It's beaten slightly by the improved battery life and usability of the Acer and Packard Bell, but its rock-solid build quality makes it a superb choice for kids to use.